Peppermint has a long tradition of use as a digestive aid and is especially effective in calming the intestinal muscle spasms that cause abdominal pain. The volatile oils contained in peppermint, particularly menthol, are the key active ingredients although other constituents present in peppermint may also contribute to the plant's therapeutic effects. Peppermint oil is a soothing digestive aid. Helps to maintain a settled digestion. Particularly beneficial for sufferers of IBS. A high potency and quality supplement. Current research and usage is tending to focus on peppermint oil's role in the management of symptoms of irritable bowel syndrome (IBS). IBS is caused when the gastrointestinal tract behaves abnormally. The muscles of the gut become hypersensitive, leading to fierce, painful contractions. Peppermint Oil is known to soothe these contractions, as demonstrated in clinical trails. 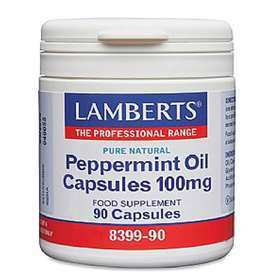 Lamberts peppermint oil capsules contain 100mg of pure natural peppermint oil, distilled from the leaves of the plant. Peppermint Oil 100mg. Encapsulated with: Sunflower Seed Oil, Capsule Shell (Modified Starch, Glycerol, Gelling Agent: Carageenan, Acidity Regulator: DiSodium Phosphate).